A marine and Afghanistan war veteran named Gabriel (Shia LaBeouf) navigates a post-apocalyptic landscape in search of his son, who was taken from him. "Man Down" is directed by Dito Montiel and is written by Adam G. Simon. It stars Shia LaBeouf as U.S. Marine Gabriel Drummer. He is married to a woman named Natalie, played by Kate Mara. The pair have one young son together named Jonathan, played by Charlie Shotwell. The only other person in Gabriel's life is his best friend/informally adopted brother and fellow Marine Devin Roberts, played by Jai Courtney. The film is told in a non-linear fashion and opens with Gabriel and Devin navigating what appears to be a post-apocalyptic America in search of Gabe's wife and son. Then, it all flashes back to Gabriel and his family prior to the war in order to set the stage to show the events that happen prior to him being shipped off to Afghanistan. This allows the audience to get a glimpse into just how much he loved his wife and son. The other portion of the movie is about Gabriel in Afghanistan, primarily told through an interview between Gabriel and military Counselor Peyton, played by Gary Oldman, who is asking him questions about a recent incident that occurred in Afghanistan. This is another one of those movies that is really hard to really talk about without spoiling everything. We will say the non-linear timeline really serves the narrative well in this film. The audience is left searching for answers as information slowly comes together. 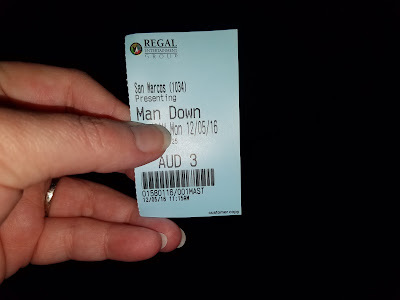 Some audience members will absolutely despise what "Man Down" does in the end, and others won't, but pay attention closely because things are ultimately said and done very slowly to give you clues and hints as to what all is going on. 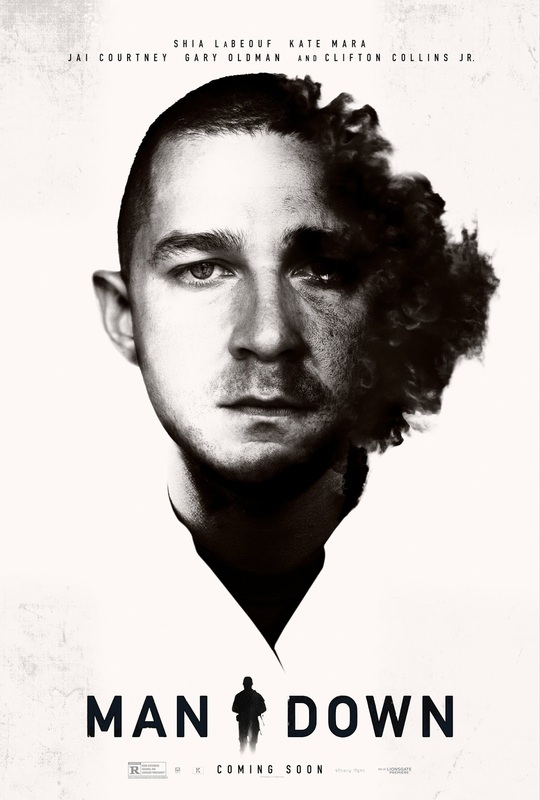 Shia LaBeouf does an exceptional job as Gabriel Drummer, surprisingly enough. He sells his role as both the loving family man and as the well-trained Marine while offering a very layered and thoughtful performance. No matter how he acts in his personal life, he is certainly a damn fine and talented actor when he wants to be. It's really him who carries the entire film. This is not to say that the supporting cast isn't good in their own right. They all do a fine job, but it's LaBeouf that really shines. The biggest downfall of the film is its pacing. At merely 92 minutes long, it feels twice that length. The film is very slow, and it isn't until the third act where everything starts to come together. This is when we got really engaged in the story. Again, this is where the film will lose the majority of its audience, put off by the ending in a manipulated fashion. We are somewhere in the middle. The ending is packed with emotion, but it made us wonder if the entire thing up until this third act actually earned such a powerful ending. We found "Man Down" to be a mostly interesting and unique take on a subject that has been covered many times before, but in a vastly different fashion. The ending doesn't completely make up for the molasses-slow beginning, but it is just enough to salvage it and make it worth watching if you can stick it out to the end. Realistically, it still isn't worth the cost of a full priced movie ticket, but hey, if it's on television or out at Redbox, why not? Shia LaBeouf gives an excellent performance, and though he's not given much to do, Gary Oldman as the exposition character is always a treat to see on the big screen.